ABOUT US - VISION, STORY - Just Say Gnome! Just Say Gnome! is a visionary and fun Garden Gnome company dedicated to making politically fun and spiritually inspiring cement Gnomes to lighten and enlighten everyone's life. Most of our quality handmade gnomes are named based on puns combining heavy political, intellectual, and metaphysical perspectives with the carefree innocence of Garden Gnomes. 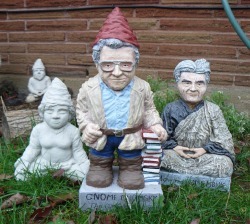 From Gnome Chomsky and the Garden OMs to Howard the Zinn Monk and the GreenMan Gnome we hope they'll make your Heart happier and your Garden more fun and inspirational. To learn more about Just Say Gnome! 's philosophy and basic goals please click [here]. The True Story of Just Say Gnome! To explore the origins, history, trials and tribulations, and continuing progress of Just Say Gnome! click [here].